Chi produces chi; that is a very important concept to understand. It is producing chi for yourself that enables you to absorb more chi from elsewhere to help yourself. That is the importance of Chi Kung in Pi Gu. Chi will keep the body strong and the digestion working well. Some people try to achieve enlightenment at the cost of their bodies but in the end they achieve neither good physical health nor enlightenment. Pi Gu is a very old way of fasting. Many thousands of Taoist masters have done Pi Gu for long periods without having a body breakdown, but the length of their Pi Gu fast would have depended on the strength of their chi. That is why Pi Gu is most efficient when used in a spiritual retreat and indeed the chi generated helps the concentration during the retreat. Taoists believe that physical health aids spiritual development and enlightenment. Taoism aims to produce chi through the physical body in order to feed the soul and spirit for spiritual work. 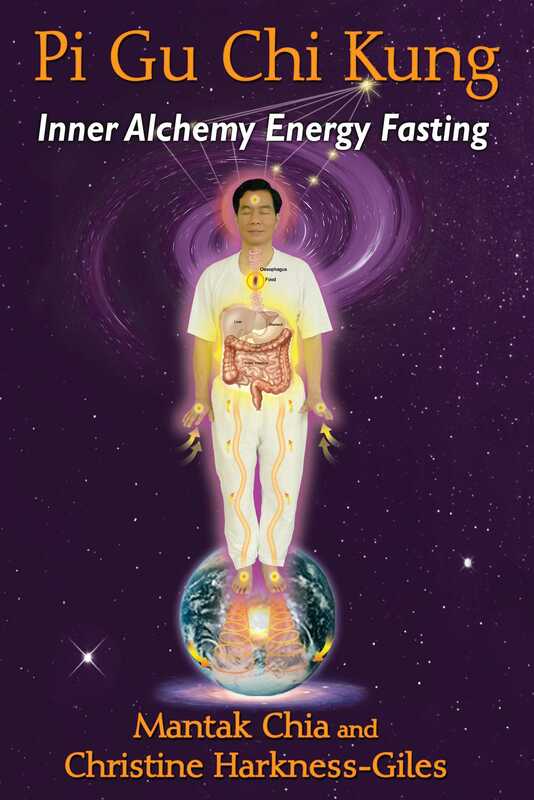 It is important that the digestive system work well and we can do some Chi Kung to improve it. Taoists have done this exercise for a few thousand years and we teach this as part of the morning exercise session at Tao Garden. It is also known as Stem Cell Chi Kung as it stimulates stem cell production. Using a bamboo hitter, our hand, or other hitting tools, we are going to focus on our inner organs and hit them to release toxins. We will be hitting the liver, gallbladder, stomach, spleen, pancreas, and small and large intestines. Your liver and gallbladder are on the right-hand side of your abdomen just below your ribcage. On the left are your stomach and spleen, and a little further down, your pancreas. The small intestines are in the center of your abdomen below the stomach. And your large intestines encircle your small intestines. 1. Stand with your knees slightly flexed, and rub the right-hand side of your abdomen below the ribcage to stimulate your liver and gallbladder. Then breathe into the area, hold your breath, and tap with the hitters at a steady rhythm. 2. Move to your abdomen just below the ribcage on the left to stimulate your spleen and stomach. Once again, rub the area you are working on, breath into it, and hold your breath as you tap with the hitter. Then move down slightly to hit the pancreas. Stimulating these organs will probably make you belch, releasing trapped gases in the digestive system. 3. Repeat: Liver, gallbladder, spleen, stomach; then go down a bit to hit the pancreas. Rest for a little while to allow the chi and blood to flow through these organs. Then warm up the organs by rubbing the surface of the body. This exercise is very good food for the digestive system itself; you are aiding it to clear itself out so that food can pass on through the small intestines, whose function is to absorb nutrients. If the first part of the digestive system has worked efficiently, the small intestines’ job will go more smoothly. Otherwise we will have a buildup of toxins in that part of the body, too, as there will be too many pieces of food that have not been predigested sufficiently. Valuable nutrients will not be in a condition to be absorbed by the small intestines and so will be lost to the body, going out as waste. 4. Stimulate the stomach and intestines on the interior left abdominal line: Inhale and pull up, spiral, pack, and squeeze energy into the interior left abdominal line. This channel runs parallel to the center line vertically between the ribs and the pubic bone, one and a half inches to the left of the navel. While maintaining the pressure, hit down to the pubic bone and then back up the same line to a point just below the rib cage. Exhale, relax, and absorb the chi. 5. Move a few inches to the left and repeat step 4 on the exterior left abdominal line. 6. Now hit the interior and exterior lines on the right side of the abdomen using the same procedure as in steps 4 and 5 above. Use the left hand to hit as the right hand covers the right kidney, or remains in a fist. 7. Stimulate the small intestine: First, rub around it in a circle. Feel the gut being activated, the blood flowing more freely, and the pockets of trapped gas being released. Breathe into the area, hold the breath, and start hitting from top to bottom. 8. Now move on to the large intestine. First shake the colon with your hand and make it move to stimulate release of matter stuck to the walls. Start with the ascending colon on the lower right-hand side of your abdomen; move up to the transverse colon, which crosses your abdomen from right to left, and then move down the descending colon and sigmoid colon on the left-hand side of your abdomen. Now tap the colon with your fist in the sequence outlined above. It is very important to keep the digestive system working; it works because it produces chi and it is the chi that keeps everything going. Refine this chi to create a link between the body, the soul, and the spirit. When the chi is more refined we call it shen, which is the food for the soul and the spirit. That is one of many reasons that Chi Kung is so important in Pi Gu.